Worship Feast Advent includes experiential worship outlines from 1st Sunday of Advent through Epiphany. The book also contains 7 worship openers for Sunday school classes and other settings to deepen the Advent & Christmas journey even more. Worship Feast Advent includes 7 original Advent Christmas-themed worship songs on audio CD and printed lyrics with chords. This is a resource for youth groups and postmodern worship communities. Through these multi-sensory worship and prayer experiences, young people will sing together, wait together, pray together, and together prepare room in their hearts for the coming of the Christ Child. The project includes a prayer station experience around the lighting of the Advent candles and an audio CD of original Advent and Christmas-themed worship songs for groups to sing together. 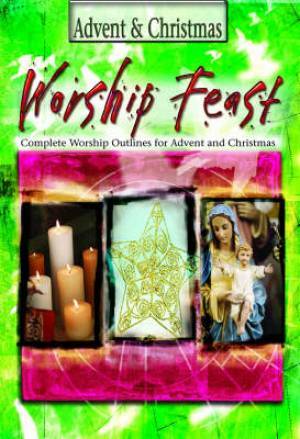 Worship Feast by Jennifer Youngman was published by Abingdon Press in September 2008 and is our 18051st best seller. The ISBN for Worship Feast is 9780687465422. Be the first to review Worship Feast! Got a question? No problem! Just click here to ask us about Worship Feast.